Optional armboard upgrade comes with armboard, slide bracket, lug, accessory rails and assembly. The 5240 Signature Series ProFrontStep Medical Examination Table features unparalleled strength, quality and design. Because the drawers of this exam table are easily reversible, it dismisses the necessity of choosing a right or left handed table making it easily adaptable to every medical facility. 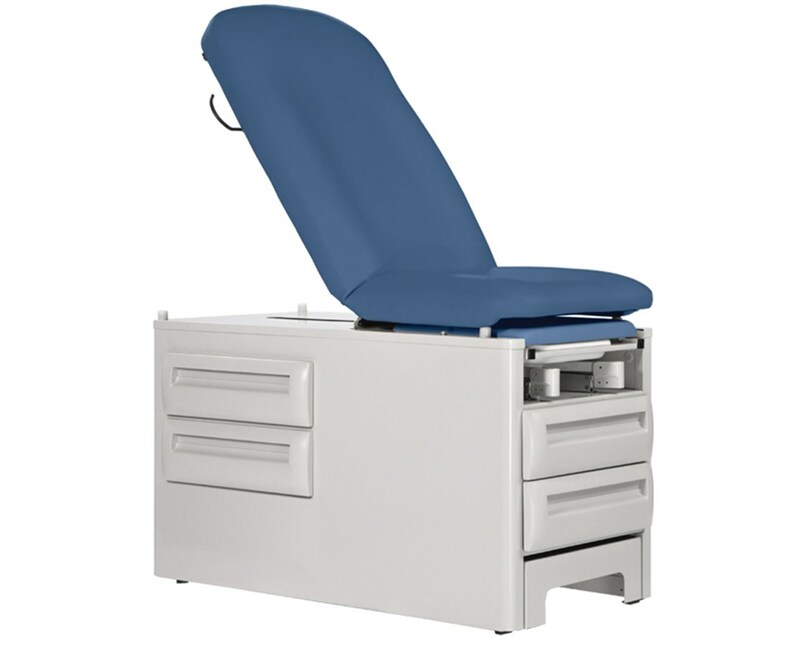 Additionally, the 5240 Exam Table enhances patient comfort with the UMF Medical Ultra Comfort Seamless top. The comfort top is vacuum formed and is easy to clean which prevents cross contamination between patients, always a concern in a medical facility. Also, the 5240 includes a slide-out leg section with removable drip pan, and a removable upholstered leg section pad as standard equipment. The easy glide comfort stirrups, all steel slide out step, and a fully articulating back section with gas spring assist make this UMF exam table the perfect choice for your healthcare facility. The exam table has two drawers with ample space on the side, and two more drawers on the front. All four drawers operate smoothly on heavy duty, full extension roller bearing drawer glides. The UMF Manual Exam Tables are available in 8 colors. The standard color displayed in the image above is Onyx. You may view the available colors in the color chart and select your preference. Please note your choice of color in the special instructions field during checkout. The Manual Exam Table is available with an optional armboard and accessory rails upgrade (specify head section or seat section). Select between two armboards and two accessory rails or one armboard and two accessory rails. Please note these accessories are factory installed. Choose desired upgrade from the drop down menu above and add to cart. The following upgrade options, if desired, are available Please note that there are additional charges for the following available additional options. Please type the option or the option code in the "Special Instructions" box at checkout. Please Note: If no option is chosen it will not be included. UMF Medical as well offers a Fire Retardant Foam (CAL133) option for your Exam Table. It is indented to provide extra safety to the product by helping stop or slow the spread of the fire in the case of an accident. The UMF Exam Table essential accessories can be found to the right of this overview. You can easily add the following accessories to enhance the UMF Exam Table simply select desired quantity and add to cart. 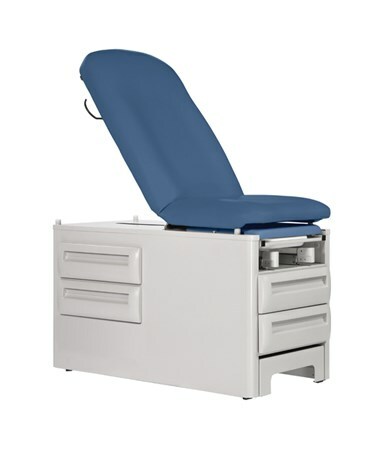 The UMF Medical 5240 Signature Series exam table has a 500 lb. (226.8kg) patient weight capacity and comes with a 5 year manufacturer’s limited warranty. 8 upholstery and accent color options. Articulating back section with gas spring assist. One touch, easy-glide comfort stirrups. Slide out leg section with removable upholstered leg rest. Removable plastic drip pan (9” x 9” / 22.9cm x 22.9cm). Pull-out all steel non slip step (7” / 17.8cm high). Two front storage drawers on full extension roller bearing drawer glides. Two side storage drawers on full extension roller bearing drawer glides. 500 pound (226.8kg) patient weight capacity. Leveling glides for smooth operation.